For the fourth consecutive year the Club entered the Pallet Challenge run by the Scottish Gardeners' Forum at this years' "Gardening Scotland" at Ingilston, Edinburgh. The pallet was called a "Highland Swing" with a golfing theme to reflect Nairns' reputation as a popular golfing resort and to celebrate the hosting of the 2011 Barclays Scottish Open at Castle Stuart. 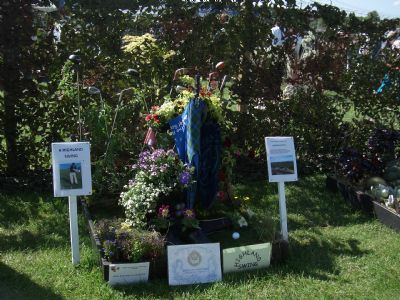 Members of the Committee made a trellis of golf clubs at the back of the pallet, planted up all the pockets of a golf bag with a colourful display of bedding, supplied by Greens' Nurseries, and added more colour with plants in golf shoes, a glove and a cap. All this was set on a mini Links course. Their hard work was rewarded with yet another Silver-Gilt medal.